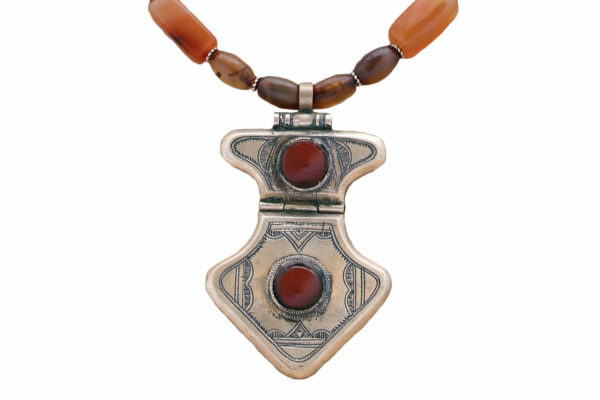 Tuareg jewellery is traditionally made from silver and more recently local artisans have experimented with incorporating stones into their designs. Not only does this enhance the beauty of their jewellery, but particular stones or colours are also believed to have certain properties. Carnelian is valued for its ability to heal disorders of the blood and prevent illnesses, and is also believed to ward off the evil eye. The intricately etched designs on the silver are often rich with symbolism and meaning. 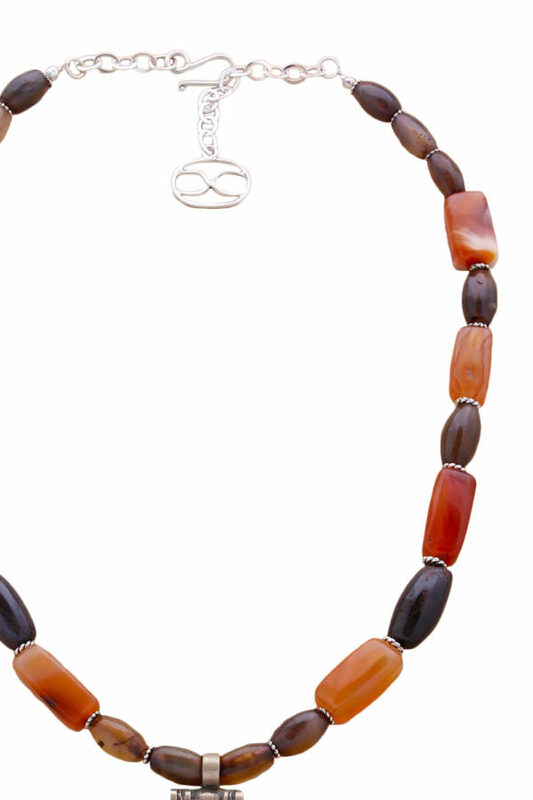 Old African Agate beads in tones of fiery orange, grey and black are separated by Tibetan silver daisy spacers. Agate is one of the oldest stones that has been regarded to bring good luck, and has been used as a folklore remedy to promote fertility. 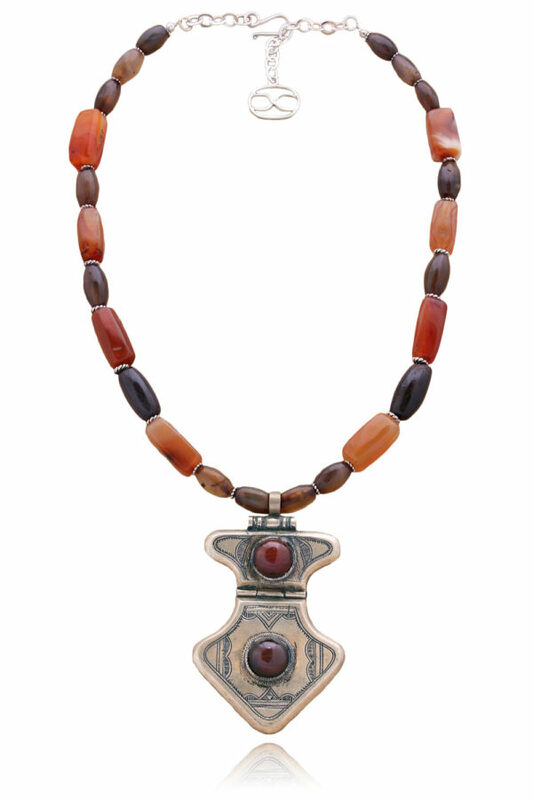 Orange coloured Agate also offers courage, balance and endurance to the mind, body and spirit. 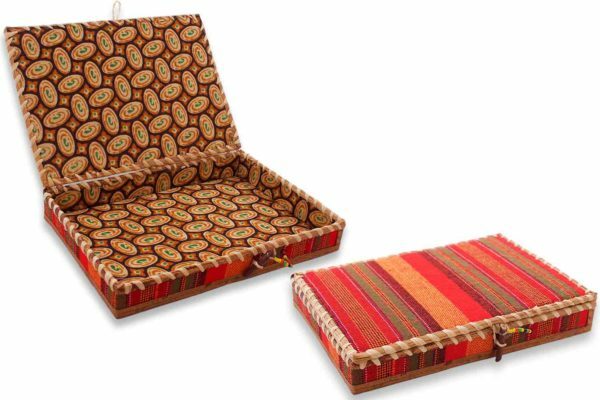 It centres physical energy and stabilises the aura, and helps achieve emotional, physical and intellectual balance. It is also said to be the stone of determination, persistence and right action. The Callidora Necklace effortlessly embodies style and character and true to its namesake, it is indeed a “gift of beauty”. Go on… treat yourself!